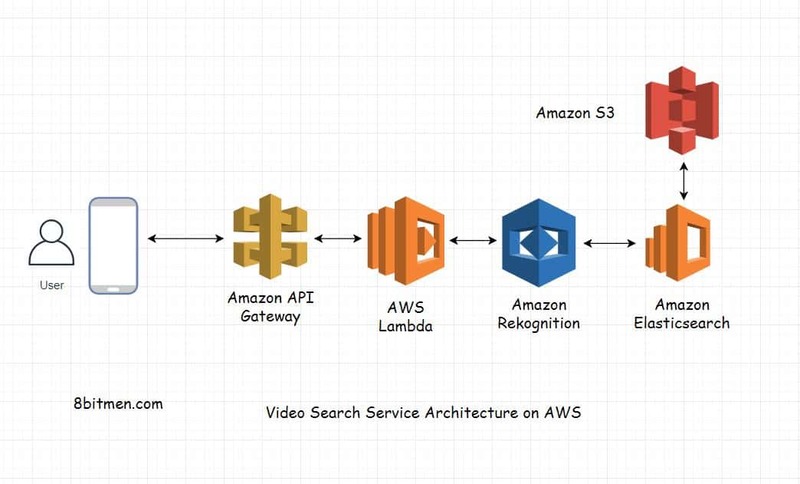 In this write-up, we will be Designing A Scalable Video Search Service with AWS Amazon Web Services Platform. So, without any further ado. Let’s have a look at the use case. The service should enable a user to run a search, with parameters such as geographical locations, important people, entities or anything specific, based on the context, on the data stored in the system in the video format. Once a user runs the search, the system should locate the video containing the searched content & the time of appearance of the content in the video. We will first begin with the basic architectural diagram. Naturally, it would be a client server architecture. For this scenario, we will pick the serverless service of AWS, AWS Lambda, for the backend processing. I’ll talk about every service up ahead in the article before that let’s have a look at the architecture & the use case flow. Here is the architectural design of the service. 1. Video data is stored in Amazon S3 which ensures scalability, availability, security & performance of the data. 2. User uploads the video via the mobile app. The app client interacts with the backend system via a REST-based API powered by AWS Gateway API. 3. The Gateway API process the video upload request triggers an event on the AWS Lambda serverless service, runs the business logic & streams the data to the Amazon Rekognition Machine Learning module. 4. The machine learning service Rekognition automatically generates the metadata from the video, such as the location, people, objects, entities in the video. 5. All the metadata generated is indexed in Amazon Elasticsearch service for faster querying. Elasticsearch is the most popular open source search framework in the industry today, having Lucene at its core. The flow above processes, indexes & setups up the data for the search queries to be run on. 1. Now that the data is setup with the metadata indexed in the AWS Elasticsearch indexes. 2. The user communicates with the backend system via the same flow. 3. For searching for a particular video, the user enters the search query in the client. The client hits the backend REST API with the query string. AWS Lambda is triggered with scans the Elastic indexes against the query string. 4. Once there is a hit, the video pointer is fetched from the Elasticsearch services & the data is fetched from the S3 storage & streamed back to the client. Every video file has some form of internal meta-data, like title, description, coding quality & other specifications. The external metadata contains the position of text, speech, entities etc. in the video. Speech recognition, text recognition & frame analysis etc. is run on the video to locate the queried content. For more information on this read video content analysis. S3 is an object storage service by AWS, with several storage classes, applicable for storing data for any kind of use case be it a mobile app, website or archiving massive amount of enterprise data & running big data analytics on it. The batch operations with S3 lets’ us manage billions of objects on the fly via its API or the management interface. This is a fully managed Elasticsearch service hosted on Amazon. AWS offers the ELK Elastic Logstash Kibana to businesses without any kind of operational overhead. This is the serverless backend services offered by Amazon. Be worry free of provision servers & other server management tasks. Pay only for the instance compute time, not the idle instance time. A fully managed REST-based API service with WebSockets. Enables us to handle a massive number of concurrent API calls, authorization & other stuff. Add video & image analysis to your application via the AWS machine learning Rekognition library. It enables us to detect faces, locations, text, scenes, activities etc. from video content. The service is based on the deep learning technology built by Amazon. Well, Guys, this is pretty much it on designing the video search services with AWS. Don’t forget to let me know your thoughts in the comments. Share it with your folks if you liked the article.